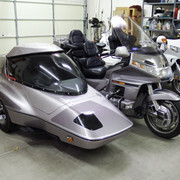 Steve Saunders Goldwing Forums > Forums > Goldwing Technical Forum > Trikes, Trailers and Sidecars > Sidecar brakes. Just picked up this rig. It has a cable actuated SC brake, is this preferable to having it plumbed into the bikes rear Master Cylinder? that was done because the bike's master cylinder does not have enough volume to operate the sidecar brake in tandem with the bike's brakes. there are a lot of complaints of "running out of brake pedal" for the rear brake when they are all plumbed together. I wondered if the GW master cylinder for linked brakes was up to the job. This cable set up definitely has some stopping power. Hannigan Motorsport (ph. 270.753.4256) can offer you some advice I’m sure. Very willing to support owners after the sale. You can also send Jay at DMC Sidecars an email or give him a call. Very helpful guy, will give you the straight poop. Will only try to sell you something if you really want it or really do need it. Looks like a pretty good alternative to more difficult measures. Might be finicky to keep adjusted though. I worked on a 1500 side car rig a while back. It had the linked brakes removed and both front brakes off the front MC and the sidecar plumbed to the rear brake. 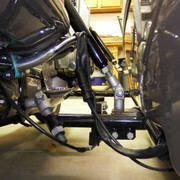 The front MC had been changed to a larger bore to operate both front brakes. I'm figuring to give Hannigan a call once I have a few more questions to ask. I'm recuperating from back surgery so it's still difficult for me to get down to where I can see things. I have used the rear master cyl on a GL1500, and two 1800's for the brake on my Champion Daytona with a single piston Brembo caliper with no problems, and a full pedal. Just made sure the system was fully bleed. When your up to it can you show a picture on how the cable connects to the bike?